In the past few years I have more than once been tasked with evaluating very expensive ($2,500 to $4,000) custom pistols that turned out to be less than 100 percent reliable. Heck, $2,500 is more than the cost of my first three cars combined. The thing to remember about guns bought for self-defense, everything else stripped aside, is this: A gun is a tool. The most and perhaps only important question is, Does it do the job? Hi-Point sells a lot of pistols. The guns are not flashy nor, in my opinion, pretty, but they are inexpensive. 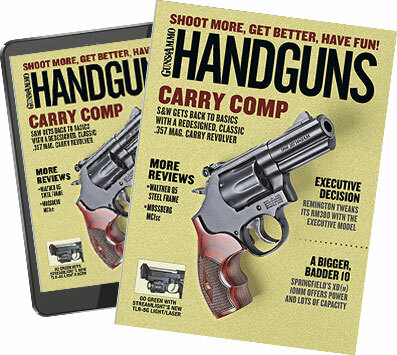 I recently had the chance to review the Hi-Point C9 for this magazine as well as for Personal Defense, a TV show on The Sportsman Channel. The C9 is a polymer-frame 9mm fed by a single-column eight-round magazine that has a suggested retail of only $179. A quick search online showed it was selling for close to $50 less than suggested retail, which is less expensive than any used gun I've ever bought. The first thing I did upon taking the C9 out of the box was fire 200 rounds as fast as I could load and fire it. As the pistol only came with one magazine, that took a while, but I had no malfunctions. Let me say that again: It went bang every time I pulled the trigger during my pre-test, during filming for Personal Defense and at my later range sessions where I tested it for accuracy. If you think the C9 has odd proportions, you're right. That's because that it is a straight blowback design, very unusual for a 9mm. The slide is both big and heavy to absorb the recoil energies of the cartridge. The slide is a zinc-aluminum alloy and has a black powder-coated finish. The pistol comes with three-dot sights, yellow in the front and red in the rear. The front sight is metal and of one piece with the slide; the rear is plastic and adjustable. The sight picture they provide is not very good, but it does allow you to aim the pistol more than well enough for use at self-defense distances. Hi-Point also provides a rear ghost ring sight as well. The barrel is fixed to the frame, allowing for better than expected accuracy. The slide makes the C9 seem bigger than it really is, but it still is no pocket pistol. It has a 3.5-inch barrel and weighs 29 ounces. It is roughly the size of a Glock 19 but heavier. Yes, it has half the magazine capacity of a Glock 19, but it's only one-third the price or less. Hi-Point sells extra magazines for a mere $15 apiece. The frame of the C9 is high-impact polymer. The front and back of the frame are serrated for gripping. The grip of the pistol has mild finger grooves that fit my hand correctly, but I have small hands. I had no problems with the slide rubbing on the web of my hand during firing, but someone with large hands might. The grip was very comfortable, and with the weight of the slide soaking up the recoil, shooting it was a pleasant experience. The single-action trigger pull measured nine pounds, but I measured it five times because I just couldn't believe it was that heavy. For some reason it feels at least two pounds lighter. There is a frame-mounted safety on the pistol—down for Fire, up for Safe. I was able to manipulate it with the side of my thumb while keeping a firing grip on the pistol, but I wouldn't want to have to do it under stress. The C9 also has a magazine disconnect safety. An eight-round magazine with finger extension is provided with the pistol, and Hi-Point sells 10-round magazines with polymer grip extensions as well. The slide locks back on an empty magazine, but there is no manual slide release lever. Throw a loaded mag in and rack the slide by hand. Hi-Point sells the pistol with a black suede Galco Paddle Lite holster for only a few bucks more, which I think is a really smart move. I think the Hi-Point would make a fine shelf or toolbox gun. Would I carry it? No, it's too heavy for its size, and I have better options available to me. For those people who don't have better options and are short on cash, Hi-Point's C9 might be a lifesaver. You can't go wrong with a reliable 8+1 9mm, plus you get a decent Galco holster right with the gun. Further, the C9 is so inexpensive you'll have plenty of money left over to buy practice ammo.